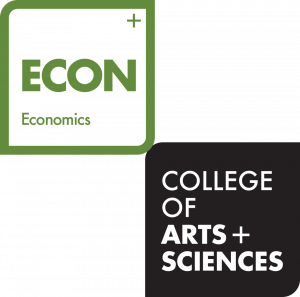 Incoming data give little reason for serious concern about the economy. The labor market held strong while manufacturing sentiment strengthened in January. The housing downtrend might be less than feared. And the Fed has taken rate hikes off the table for now and will break the quarterly rate hike cycle by taking a pass on a March hike. At this point, fears of recession seem overblown. While I expect the Fed to hold rates steady through at least mid-year, it is worth wondering if the economy in fact slows down sufficiently to keep the Fed in a dovish mood past March. 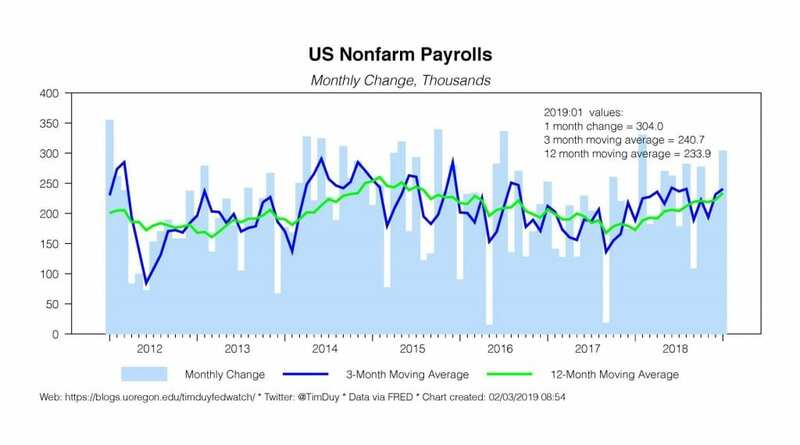 Nonfarm payroll growth came in well above expectations with a 304k gain for January. The twelve-month moving is at 240k and remains on an uptrend. Note though that the previous month’s original 300K+ gain was revised sharply lower, leaving me a bit wary that the January number will follow suit. 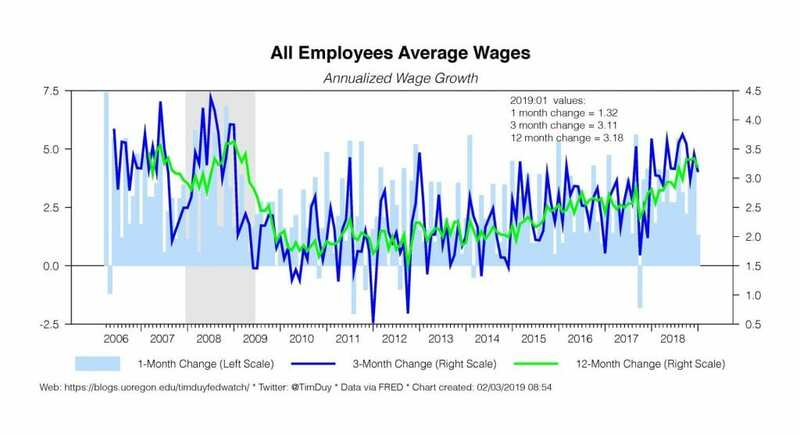 That said, there is little doubt the economy continues to enjoy strong job growth as the expansion approaches a record length this summer, well beyond the point many anticipated the labor market would hit supply side constraints. 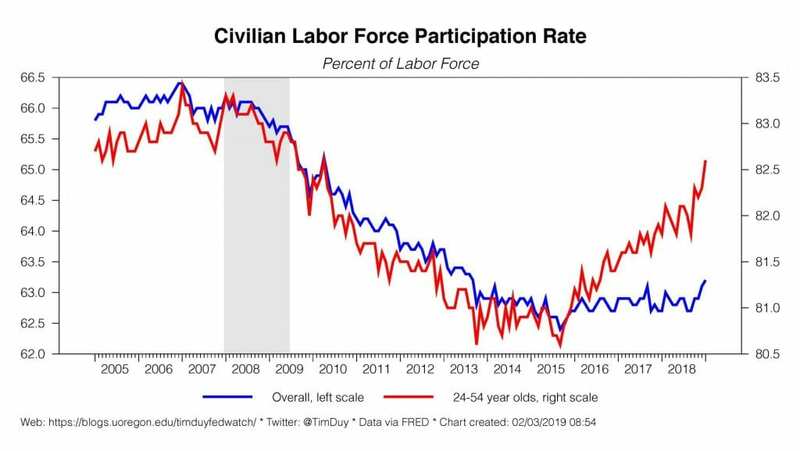 Indeed, the labor market appears to be easily meeting the demand for workers, with rising labor force participation and sufficient labor force growth to hold unemployment fairly steady over the past year. The unemployment rate rose to 4.0% compared to 4.1% last January, although this month the number was likely inflated somewhat due to the temporary government shut down. The rise in labor force participation among prime age workers is particularly encouraging. It appears that persistently low unemployment and faster wage growth has elicited a supply-side response from the labor market. A combination of low unemployment, strong job growth, and firmer wage growth will help support consumer spending in the months ahead. 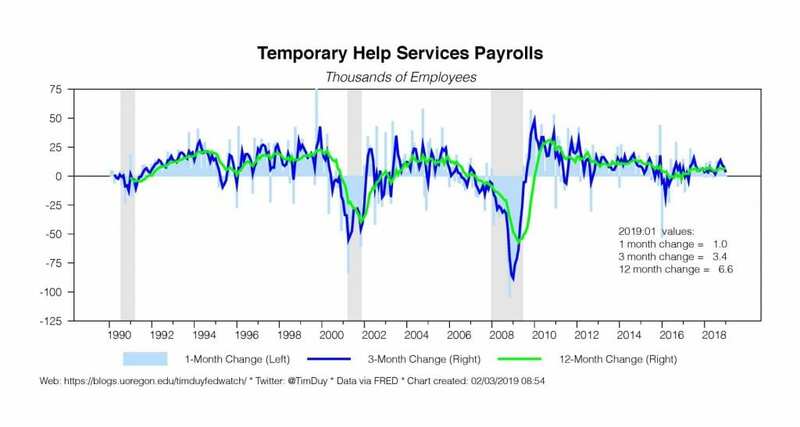 Temporary help payrolls, a forward-looking indicator, continue to rise, suggesting that the strong of job gains will continue in the months ahead. The pace of temp help growth, however, is fairly subdued. I think this has less to do with any weakness in the economy and more to do with a preference for permanent jobs. In other words, the availability of jobs may be pulling workers out of this sector. 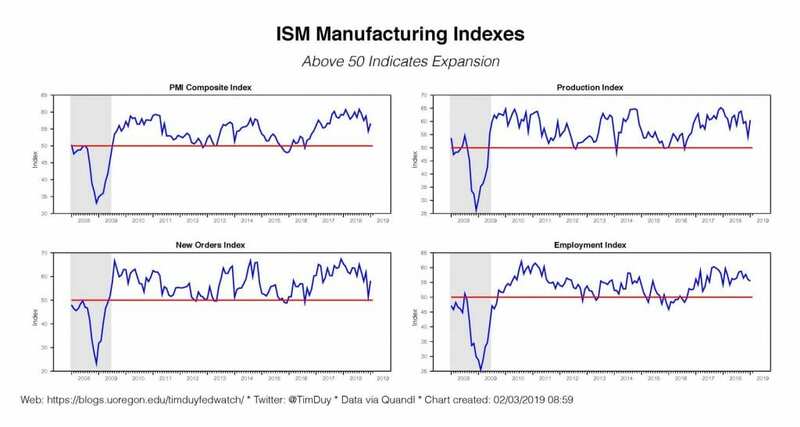 In something of a surprise, the ISM manufacturing number partially rebounded from the weak December report. Notably, the new orders index bounced off the break-even point; it may be that pessimism emanating from turbulent financial markets weighed on confidence and hence orders during December. The gain speaks well for the strength of the economy as 2019 begins. New home sales rebounded in November, gaining 16.9% with a bounce in new homes sold but not started. Sales prices fell, with the median price down 11.9% from last year. This suggests that the primary problem in housing was that the higher end of the market was finally sated and builders needed to move to a lower priced product to sustain sales. It also suggests that fears of a housing slowdown may be excessive. Still, with December pending sales down, the jury is still out on that topic. We will need a few more months of data to gain some clarity on the topic. The Fed took itself out of the game last week with a particularly dovish shift at the conclusion of the January FOMC meeting; see my take here. I admit that I am a bit wary that the Fed has overshot. 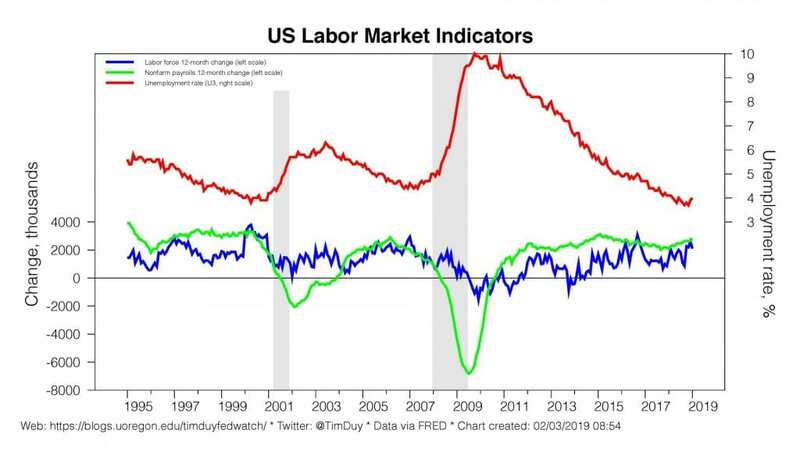 It is not in my nature to say the Fed is out of play when job growth is accelerating, but I find the case easier to make when unemployment is holding steady and inflation remains well behaved. That said, I wish we had more clarity on the magnitude of any shift in the dot-plot in January. Presumably, the dots shifted to make the possibility of rate cuts and hikes nearly equally likely. That, however, is typically not how the Fed’s models work if there has not been a major forecast revision (note that Federal Reserve Chairman Jerome Powell claimed the forecast did not shift substantially). Moreover, I am made a bit nervous by Dallas Federal Reserve President Robert Kaplan claiming that rate hikes were on hold for “certainly at least the first couple of quarters.” To be sure, a pause through the first half of the year is my base case. But I am uncomfortable with Kaplan engaging in date-based forward guidance rather than data-based forward guidance. Has the FOMC committed to a pause through mid-year? Because that seems the only way the Kaplan can make such a promise. It’s those kinds of promises that come back to haunt the Fed. Does “patient” mean the next meeting, so just near-term forward guidance? Or does “patient” mean the next six months, so longer-term forward guidance? Bottom Line: Strong job growth, rising wages, and low inflation is pretty much a Goldilocks economy. Moreover, the Fed moving to the sidelines improves the odds that this expansion continues through next year; low inflation is key to restraining any hawkish impulses that central bankers harbor when presented with persistently low unemployment. 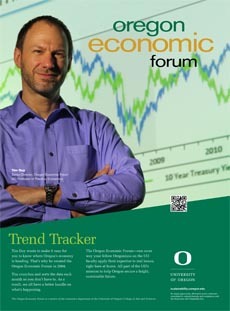 I am less worried about recession than the possibility the Fed has a change of heart sooner than I anticipate.